If you’re planning on taking your son to the rodeo this year, he needs the perfect cowboy outfit to make him look and feel just like the real thing. While a plaid button-down shirt and comfortable bootcut jeans are a given, putting together the right accessories will allow you to complete the getup. Don’t forget these four accessories when picking up a new western outfit for your little man. Whether your son prefers a braided belt, an embossed or engraved belt, or a woven leather belt featuring concho embellishments, a boys leather belt is essential for achieving an authentic western look. Make sure to let your son choose a special rodeo buckle to go with it to help him remember the special day for years to come. When going to the rodeo, any old pair of tennis shoes or sneakers simply won’t do. The rodeo is the perfect event to finally get your son his first pair of cowboy boots that he’s been asking for. There are thousands of designs and colors to choose from when it comes to cowboy boots, so it is a good idea to take your son with you to your local western clothing store to let him pick out his favorite pair. What’s a cowboy without his cowboy hat? 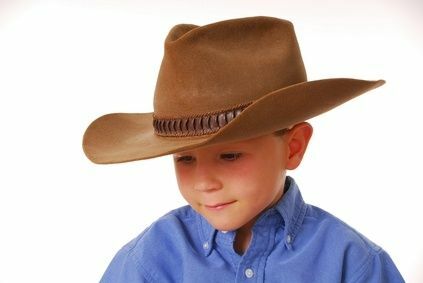 Luckily, there are many styles of western hats to choose from, so your son can find a hat that complements the rest of his outfit perfectly. Straw hats, leather hats, and wool hats are just a few of the options he has to choose from. For a more dressed up look, a western vest made from lambskin, suede, or canvas is sure to make your little cowboy look handsome as can be. If your son prefers, bring on the tassels, concho embellishments, and studs!